Syrian authorities have returned the body of the slain 14 years old Lebanese and freed his two uncles, who said they came under fire in a fishing boat along the sea border with Syria, an AFP correspondent said. AFP reported that body of Maher Hamad, who together with his uncles was snatched from their boat off the Lebanese coast on Saturday, was handed over to officials at the northern border crossing of Abboudiyeh. A funeral procession for Maher later made its way from his parents’ house in the village of Arida towards the border, where mourners pelted Syrian troops on the other side with stones. “There is no God but God, Bashar al-Assad is the enemy of God,” they chanted, referring to the Syrian president who has faced 10 months of anti-regime protests. Without the troops retaliating, the mourners turned around and made their way back to the village mosque. Fadi Hamad, who was handed over to Lebanese authorities overnight with his brother Khaled and the body of their nephew, recounted what he said was the boy’s fatal shooting at the hands of Syrian troops. “We had cast our nets the night before and early Saturday morning we headed out to pull them in,” Hamad, 36, told AFP. “We then saw a boat pulling up to us and urged it to move back as they were nearing our net,” he added. 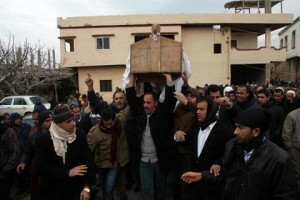 The gunmen then forced the three fishermen into Syria, where Maher died of his wounds, he said. Hamad said he was taken to a military intelligence centre in the Syrian coastal town of Tartous where he was beaten and interrogated on whether he was an arms smuggler. “I was asked repeatedly whether the arms were coming from Saad Hariri,” Lebanon’s former premier and head of the anti-Assad opposition in Beirut, he said. Khaled Hamad, 35, was treated for gunshot wounds to the leg. Syria’s state-run news agency SANA, meanwhile, reported that a patrol had caught three Lebanese who were attempting to enter Syrian waters for “smuggling activities”. SANA said port officials off Tartous warned the Lebanese to obey orders but the fishermen instead “threw their boxes in the sea in an attempt to escape”. The boat then came under fire from “another Lebanese boat coming from Lebanese waters,” leaving one person injured and another dead, according to SANA. Lebanese President Michel Sleiman has condemned the incident, which sparked protests in Arida that saw angry villagers on Saturday burn tyres some 200 metres (yards) from the border, briefly closing down the crossing. Protesters also set up a tent near the border where several gathered on Sunday to protest the incident. Faced with an anti-regime uprising, the Syrian army in November laced the Lebanese border with landmines in a bid to curb arms smuggling and to hamper army defectors and refugees from fleeing. Syrian troops have also staged deadly incursions into border villages in Lebanon. Syrian security forces killed three members of a “terrorist group” on Friday night as they tried to infiltrate the Tal Kala area from Lebanon, according to SANA. This should not go unpunished… Lebanon’s so called government has a duty to all its citizens but they are busy defending the Syrian regime. SANA can’t be believed on anything. But there can be no justice for this act Hannibal. Children have been their favourite targets. The highest task and responsibility of any government is the protection of its people against any violence or attack!!! Had this been in the south what would the reaction be? All this does is push people to arm themselves. Too bad there isn’t Lebanese solidarity. Hezbollah men would rush to protect Iranians in a base in Syria supposedly but not to protect fellow Lebanese and help them because they’re Sunni. I can tell you what HA will say when asked why they dont do anything about this ” Israel kills Lebanese every day and no one say a word now that Syria killed a few Lebanese we want to make a big fuss about it” ? HA is not Lebanese they are Iranian. Look at past HA videos, go to the southern suburbs of Beirut and you will see the Iranian flag all over the place and these days you can also see Syrian flags and Bashars pic all over the place also. Walayat al Fakih (Iran stayle government is a main HA Goal) and only 10 years ago HA started putting Lebanese flags behind the speaker in interviews and speeches before that it was always Iran’s flag.